Schoolhouse Rock is a collection of animated musical sorts that date back to the late 1970s. I'm not sure if they're still shown on TV, but I remember as a kid seeing them on Saturday mornings, interrupting my flow of awesome animated goodness. There I was, just having finished watching a show about dragons and warriors or about a boy that transforms into a car or whatever, then before the next highly anticipated show starts I get blasted with some stupid muscial number trying to teach me something. I didn't like them much as a kid, but how would I feel about them now? None were great, but some were decent, and then there were some I really didn't care for. 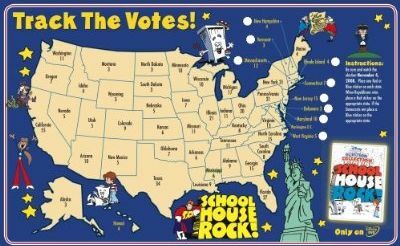 This DVD is called Schoolhouse Rock - The Election Collection , however most of the songs don't really have any relation to the election process. Actually, there were only two songs that covers the election process, I'm Gonna Send Your Vote To College , and a bonus song. I'm Gonna Send Your Vote To College is one of the songs that I didn't care for too much. It attempts to explain about the electoral college, but it does so by drawing comparisons to real colleges, like universities. One of the lines in the song says that everyone who graduates from the electoral college becomes president. To me, this seems to make things more confusion, not more clear. I don't think kids would get this concept. I'm Just A Bill is probably the most famous of the group, and the one I remember seeing most often. It tries to explains the process for creating a federal law, and it doesn't do a bad job, though it does oversimplify a bit. Not that I'm an expert on the whole process, but I'm sure it's much more complex than this little cartoon makes it out to be. Still, the song is good, and doesn't feel dated in the least, nor does the animation. It's easy to see why this is one of the more popular ones. Now on to one of the worst, Walkin' On Wall Street . It's supposed to teach kids about how the stock market works, but I as an adult could barely understand what it was talking about. It wasn't just the lyrics that were poor, however. The singing was also fairly poor, and the tune wasn't catchy at all. But on the plus side, there weren't a bunch super skinny girls with huge breasts dancing around like in Tax Man Max . Holy crap, what kind of subliminal message is that supposed to be sending to our kids? Mother Necessity is another short that I didn't find very educational. According to the title, I thought it was supposed to teach how necessity is the mother of invention, but instead it basically just lists a few inventions and the people who invented them,, with a couple super-oversimplifications of the reasons they were needed. And it implies that those people created their inventions when they were little kids. Yeah, right. How about covering the real reasons why this inventions came about? This really wasn't my cup of tea, but I could see how some kids would like it. It's mildly educational, but no substitute for a textbook or even an explanation from mom or dad. This release comes with a map to help track the upcoming election, which is cool if you bought the DVD already, but if you haven't then I'm sure you could just find and print out the same map off of the internet somewhere. 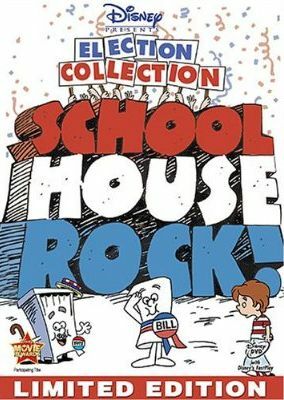 Schoolhouse Rock: The Election Collection , released by Walt Disney Video, is available starting September 23, 2008.